I need to enlist some help here….Is this Topshop coat a yay or a nay? I can’t quite make up my mind. Is there enough faux fur, is there too much? Is the length wrong? Is the colour nice? Will it make me look like a Grandma? Advice needed….It might help you make a desicion when you know the price, £175. Oh and sorry for for the short post, went out last night and may have had one too many cocktails and then went to a food event today and am majorly suffering. Still feel a little delicate now…. 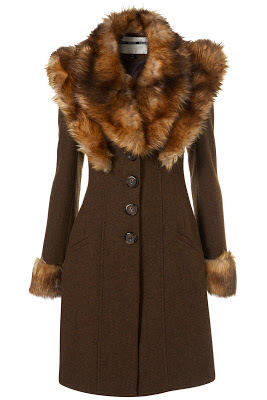 It is a gorgeous coat, but I think there is too much fur…it'd be better if it was collar only, I think. It's got all the right elements (gorgeous colours, flattering cut) but the fur on the cuffs and shoulders is too much. Buy a gorgeous coat and customise your own collar. way too much fur, other than that gorgeous.